Indications: Acid reducer used to treat stomach ulcers and gastroesophageal reflux disease (GERD). Summary Recommendations: Tagamet HB reduces the amount of acid produced by the stomach to prevent heartburn and symptoms of GERD. The medication may be part of a treatment program that includes dietary changes and other medications. Follow the program prescribed by your doctor to the letter. The medication is safe for patients 16 years and older. Children and teens should not take Tagamet HB. General Precautions: Tagamet HB works my inhibiting histamine that facilitates acid production and release in the stomach. The medication is commonly prescribed or suggested in patients with GERD – a condition that causes acids of the stomach to back up into the throat and cause heartburn and damage the esophagus. Tagamet HB should be used as prescribed and only by the patient prescribed to use it. If you commonly use antacids to calm heartburn talk to your physician about taking antacids while taking Tagamet HB. You may need to stop taking antacids or change when you take antacids. Tagamet HB has been known to increase susceptibility to the virus that causes pneumonia, generally in older patients and patients with diabetes and/or impaired immune system function. Some prescription and over-the-counter medications may be contraindicated with Tagamet HB so tell your doctor about all the medications and supplements you are taking. Effects While Trying to Conceive: Human studies on the prescription strength version of Tagamet HB have not been shown to alter sperm production, sperm movement or the ability of sperm to fertility a mature egg. In animal studies, no changes in mating behavior or outcome have been noted. Effects on Pregnancy: Tagamet HB is not associated with pregnancy or fetal risk. When injected into the bloodstream during labor, no negative outcomes were noted, however, use during the first trimester of pregnancy has not been adequately studied. Tagamet HB crosses to the fetus via diffusion through the placenta. 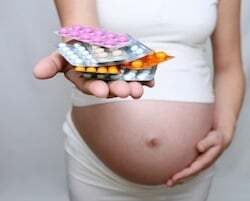 The diffusion is slow with only a small amount of the medication reaching the fetus after a single dose. Chronic or prolonged use may result in increased fetal exposure. Safe During Breastfeeding: There is no indication that Tagamet HB has any negative effects on infants breastfeeding to mothers taking the medication. Tagamet HB does pass to the infant in breast milk, but the concentrate is extremely low at about 5 mcg per 400 mg oral dose. The drug manufacturer suggests avoiding Tagamet HB while breastfeeding, but the American Academy of Pediatrics lists the drug as safe for breastfeeding mothers.